Hard work has a lot of us exposed to the sweltering summer conditions. A blanket of heat with climbing humidity are there to greet us from dawn until well after the sun sets. Even if your career does not have you outside, the commute drains what little energy we have left from our responsibilities. This is where the temptation to create shortcuts is born. Matters that we judge as being able to be put off create safety hazards in and around the pool. The last thing we want to encounter on our arrival home is to find that the pool requires additional attention and extra pool service Sarasota. How do we head off this situation so that we can safely reap the rewards of pool ownership for us and our loved ones? Safety with peace of mind involves delegation. This is not abdicating responsibility but embracing it by involving individuals with superior skill sets. Why deny our rush to relaxation because we had to research how to balance the pH level in the water? One quick miscalculation can result in the pleasant pool become anything from a breeding ground for microorganisms to a stinging cauldron for our eyes. People of all ages often ingest water due to their frolicking. We should not have to restrain their relaxation because we can not yet get to monitor the pool levels to proclaim it safe. 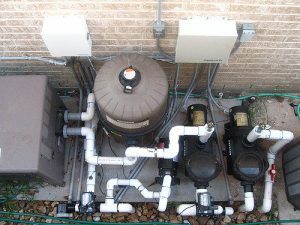 This is just one of the numerous complications one has to contend with if they opt to go it alone with pool maintenance. By enlisting the aid of a professional pool service, the household has protection from the opening act until the final call of that last late season dip. The daunting list of activities that have to be accomplished to safely open up swimming season is no longer a worry. Pesky routine maintenance that extends the life of the pool is rigorously paid attention to. Finally complete drainage and the attention to detail for all off the equipment at closing time ensures that they are safely tucked away from the ravages of winter. Surfaces are skimmed on a scheduled basis. Filtration and circulation systems are kept in optimal order. Potential hazards and pinch points are recognized that would fly under your radar. Daily and seasonal safety factors are addressed in a preventive matter that preserves the budget of the family. Odd sounds and other white knuckle signs no longer require hope that they just go away on their own. Aging equipment often goes offline just when one needs it the most. Filters, pumps, and heaters are just a few examples of the many parts that have to work in harmony. While money should be no object for the safety of our loved ones, people panic in just buying replacement parts. This does not solve the source of the problem. Pool professionals have both the extensive experience and training to properly deduce the source of the problems. Their troubleshooting skills not only fix the matter at hand but prevent it from happening again in the future. This allows you and your loved ones to get to enjoy the pool much more often and safely swim the summer away. These are just a few of the innumerable benefits that come with having a Certified Pool Operator in your corner. Sarasota and the surrounding counties have seen the proficiency and reliability that Grand Slam Cleaning and Maintenance brings to each and every pool they service. Your family’s safety is their first priority. They not only have the technical skills but can communicate them in a straight forward and transparent manner. Consistent weekly attention to your pool needs thwart emergencies, extends the life of your pool, and allows for loved ones worry free relaxation anytime during the summer. Your budget will reflect what our customers already experience. Your pool will be restored to that safe form of relaxation with Grand Slam in your corner.